How Do I Tell if a Book's Available? Where? How Do I Resolve Problems with my Order? Why Is Your Site So Different? I'm a return visitor. Why's your site so different from a year ago? We've changed web hosts. This lets us to show you more information about a book. While the change leave us with a different look, you'll find most of the old features under various headings in the menu bar. A major advantage is that you can also now order books we don't have in the store. You can tell what these are when you see that a book "Ships in 1- 5 days" or says that it's a "Special order." To focus on books we either have on hand or have had recently, change the Sort Results dropdown seeting from "Relevance" to "In Stock." Why should your site offer more titles than you stock? Many of our customers learn about books of interest to them or that have gained importance in their field sometime after they've come and gone from our shelves. In offering books we can have shipped to you directly from a distributor or sent to the store for you to pick them up there, we provide you more options. How Do I Tell if a Book Is Available and Where? What does "Available on our shelves" mean? This means we had at least one copy in the store at the time we uploaded our inventory, usually in the late afternoon, one to three hours before we close. It can take up to four hours for the inventory update to take. We find that Murphy's Law applies here in spades, though. "Available on our shelves" is accurate for most books, most of the time. So if you're coming a ways to pick u[p something you see on our website, it's usually a good idea to give us a call (510.548.0585), email us via our contact form, or place as Pick up at Store order beforehand. What does "Ships in 1-5 days" mean? This means we're asking one of our main distributors to drop ship the book to you, if you're ordering it shipped to you. When you choose the Pick Up at Store" option, it means we're having the distributor ship the book to us. This means we know something about the book, but we're not at all certain we can get it. If you order a "Special Order" book, you'll hear back from us about whether we're able to get it for you. If we can't and you've paid for the book, we'll refund your money. You seem to have a book. How do I get it shipped to me? Set up a website account, if you haven't already, and select either credit card or PayPal as the means of payment. Make sure that we have your shipping information, especially if this differs from your billing address. You seem to have a book. How do I have it set aside so I can pick it up within the next two weeks? Set up a website account, if you haven't already, and select "Pay at Store" as your payment option and "Pick up at Store" as your shipping method. You can also prepay though the web site, if you prefer to do that. Choose Credit Card or PayPal as your payment method. I've looked up a book and it says its on your shelves. How can I be sure you actually have it, before I come in and find out that you don't? It's always a good idea to call or email before you come. We update inventory information each afternoon, but fresh information can take until 8 or 9PM to load to the site. Right now, this is the best we can do. Why Do I Have to Leave Billing Info for a Pick Up at Store order? Do give us a call at 510.548.0185 or 800.676.8722 during business hours if you prefer that. You don't seem to have a book on your shelves. How can I have it shipped to me? We provide two options here. 1) You can order the book through our webstore, creating an account, if you don't have one, then choose a payment method, which include Pay at Store. 2) If you're local and don't want to fuss with on-line shopping, send us an email via our contact form or give us a call at 800.676.8722/510.548.0585. We can have it shipped to the store where you can come in and get it. Shipping to you directly from our distibutor is often the quicker option, since it involves less handling, should you need the book as soon as possible. Can you ship me a used book? The short answer is "yes." Right now we list on this site new books, so if you desire to search our used book inventory, you would do that through our page on Biblio. You can order books from us directly from this site— it'll forward to us what we need to fulfill your order— or you can contact us though our email form, tell us what you seek, and we'll work out with you the best way to transact your order. If you're planning on coming our way, this would probably involve you paying for the book(s) when you pick them up. Can I have a book shipped to someone other than myself? Yes. But since credit card fraudsters and identity thieves also often place such orders, shipping to an adress other than the billing address can trip warning flags. It may take us a little longer to process such orders should other aspects prompt us to contact your bank and/or other parties to become a little more certain that you're probably who you say you are. We'll scrutinize more closely orders made from one state that ship to another state, for instance. We'll be more suspicious about new customers than those with a track record. The kind of book purchased, its cost, the number of copies purchased can raise suspicions. This isn't a complete list of what we look at, of course. If you purchased a book through the on-line store, ship it back to us and when we process the return, usually within a couple days of receiving the book back, we'll email you [a code for] a gift certificate for the sale price of the book. If a different problem occured with your order, contact us. We'll do what we can to straighten it out. I placed an order but I haven't heard anything back from you. Not even an acknowledgement. Should I worry? You should call us at 800.676.8722/510.548.0585 or email us using our contact form, for something has probably gone astry with your order. Successful orders should always receive an automated email response soon after you've submitted your order. If you've been waiting for more than an hour, this may mean that your order didn't go all the way through. It's been three and a half weeks (or longer) and my book still hasn't come! What gives? You should usually hear from us, one way or the other, by two and a half weeks after you've placed a special order. Sometimes the distributor and/or publisher runs out of stock and has to schedule a fresh print run. Siunce most of the warehouses are located along the American east coast or in the eastern mid-west, sometimes weather bogs a shipment down. But we try to contact you when we hear that something like this is happening. Give us a call or email us using our contact form if it's going into the third week and you haven't heard peep from us. That could mean we need to look into your order. What is University Press Books? We're also a brick and motar store that has operated in Berkeley, California, at the south side of the Cal Berekely campus since 1974. Although we specialize in showcasing titles published by university presses, we also sell books for inquisitive, discerning readers published by commercial presses; along with poetry and other literature published by small presses. Are you the University of California Press? While we handle a number of their titles, we're actually different entities. We don't publish books. While we sell books to the university community and host readings by faculty, student groups, and other people associated with the university, we're a privately owned business. 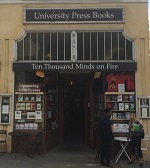 If you're looking for the University of California Press, visit them at ucpress.edu. How does a University Press differ from a trade press? Everyone who reads at all is familiar with trade presses, the Doubledays, Knophs, Penguins, Random Houses, Scribners, Simon & Shusters, Hachettes, Vintages a whole host of commercial imprints that publish fiction and non-fiction aimed at a general audience. University presses are owned by colleges and universities (or at least started out that way). While they mostly publish titles aimed at readers already knowledgeable about their topics, they also release titles aimed at general readers, such as UC Press's nature guides, Oxford's Very Short Introduction series, and a wide assortment of books, ranging from Egyptian history, labor history, Picasso, to climate change, written by academics, sure, but aimed at a curious public. UPB belongs to a trade group, the American Booksellters Association, who runs IndieCommerce, a service that connects book lovers to independent book stores near where they live, study, or work. Go to indiebound.org to learn about other independent bookstores, find out what's going on in book culture, and disvoer why shopping with dominant on-line retailers might not be in your long-term interest. Saturday & Sunday 12 Noon - 5PM, Monday through Friday 11AM - 7PM, California time. We close for Memorial Day, Independence Day, Labor Day, Thanksgiving, and Christmas. I have a question left unanswered here. How do I get in touch with you? At the bottom of most pages youll find a text link that says. Email us." Click that and you can communicate with us using the supplied form. You can use the same form even if you don't have a question, if you want to place a special order, share some feedback, or just tells us how you appreciate us. Why Is Your Website So Different?